Shane was a classic, and you can’t find a better bad guy than Jack Palance. I seldom ever missed a Gary Cooper picture if I could manage to see it. Of course, DeMille never did anything on a small scale. That tv box has a tremendous capacity to reach people. There is a lot of stuff now that is in bad taste, and I don’t see the necessity for it all. We didn’t have to do it in our time, and they don’t have to do it now. Norman Eugene Walker, known as Clint Walker was born in Hartford, Illinois. He is a retired American actor. He is perhaps best known for his cowboy role as "Cheyenne Bodie" in the ABC/Warner Brothers western television series, Cheyenne. 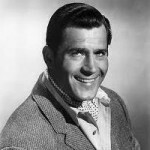 He played roles in several big-screen films, including a trio of westerns for Gordon Douglas: Fort Dobbs in 1958, Yellowstone Kelly in 1959, and Gold of the Seven Saints in 1961, the comedy Send Me No Flowers in 1964, the actual leading role despite being billed under Frank Sinatra in the wartime drama None but the Brave in 1965, The Night of the Grizzly in 1966, and as the meek convict Samson Posey in the war drama The Dirty Dozen in 1967.